This tutorial will be easy enough for a new user to GIMP as well as intermediate users of GIMP. 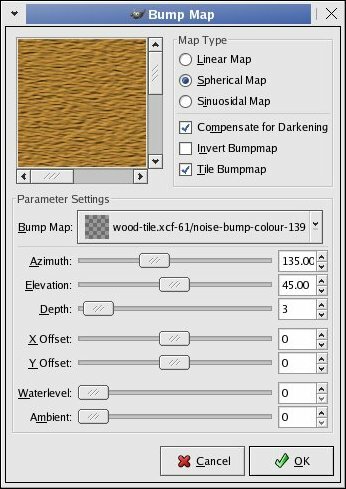 The aim of this tutorial is to create a tileable wooden texture, which can be used as a base for other modifications and is described with an example. Before you proceed you will need to have GIMP2, although this isn’t a requirement, but you might lose way if you have older versions. This tutorial can be adapted in other similar graphics manipulation programs. The base image is of 300×300. Step-1. 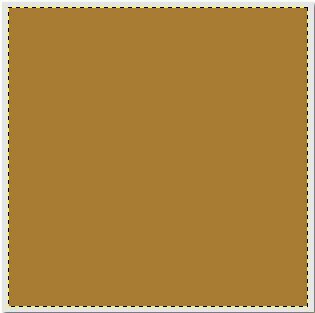 Chose any colour you wish your texture to begin with or use colour dropper to pick the colour from the image below. Step-2. Create a new transparent layer and go to Filters>> Noise>> Noisify. Un-check independent in the Noisify dialog box and increase the setting to 0.76. Rename the layer to ‘noise’ or something you favour. Those of you who are using Gimp2.2pre first you need to have a white layer instead of transparent. Then go to Filter>> Noise>> Scatter RGB and un-check independent there, and use 0.56 as the value. Step-3. Now we will create the wood skin pattern from the noise layer. You can keep a duplicate of the noise layer if you want to experiment more. Go to Filters>>Blur>>Motion Blur a motion blur dialog box will pop-up. See Image 3 for settings. To smoothen the motion blur again apply the ‘Motion blur’ filter but this time in opposite direction I.e. 3600. Image-3 Motion Blur dialog box. Now change the mode of the motion blurred noise layer to ‘Divide’ from Normal. Step-4. To create a tileable image, it is necessary that we do not have seams in the image. To remove seams there are two methods in GIMP first one is the filter which will make your tile seamless by using the image info at four corners and then overlapping them. You can do that by Filters>>Map>> Seamless. But for our work this will show visible patterns. So I had chosen a manual method. It is pretty straight forward but requires more work, again it will give better results. To make a seamless tile manually, select the blurred noise tile if not selected, press ‘Ctrl+Shift+O’ It will open the offset dialog box (see Image4). Here you keep checked the wrap option. It is necessary. Just change the X and Y values to half or similar to what the size of an image you made. Step-5. After changing the offset of the blurred noise layer, yo will get something like this. Image-5 Tile after offset wrapping. The image5 the noise layer has very subtle seam horizontally but very visible seam vertically (note image is zoomed). Now you can use “Smudge” tool (S-key) and very smaller brush size to try and remove the seam in between. If you are dexterous this method will bring better results as mostly the image have very similar patterns near the seam. After making it seamless just reverse the offset by again inputting X and Y values in negative and again check for any visible seam and remove it again by using the ‘Smudge’ tool. 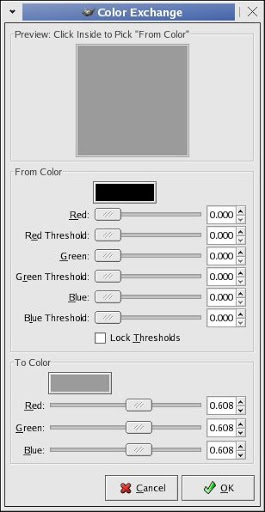 Image-6 Colour exchange dialog with settings. Step-6. 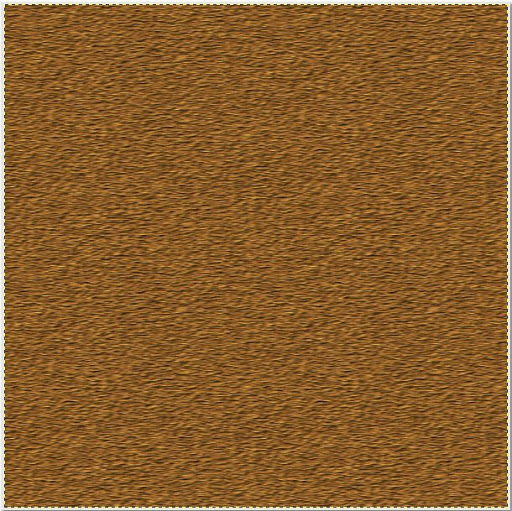 After making the Seamless tile from the noise layer we need to make it such that it can be used to provide good bump maps for the wood texture. Select the seamless tile layer, go to Filters>> Colors>>Map>> Colour Exchange. See Image 6. Chose Fro colour and to colour as shown in the image and press OK. This will change black colour to grey which can be used effectively for bump maps. Step-7. Now select the ‘base colour’ layer and got to Filers>> Map>> Bump Map. Here select the tiled noise layer as the bump map and change the values as shown in the image7. Image-7 Tile Bump Map dialog box. 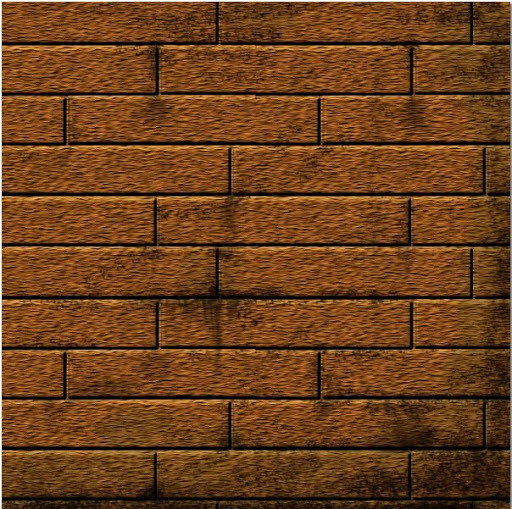 After applying bump map, you will get the very basic building block for the wood tile. The tile should look like as in image7, but depending on your settings it may vary. Image-8 Tile layers in the Layer panel. Step-8. The tile as it appears will look pretty basic and it need to dirtied up a bit. Follow the following actions carefully. Duplicate the noise layer two times and merge them. And retain the layer mode for it at ‘Divide’. Select any colour from it by using the tool “Select regions by colour” (Shift+O). Press ‘Ctrl+I’ or goto Select>> Invert Selection to Invert the selection. Without disturbing the selection create another transparent layer and rename it dirty. 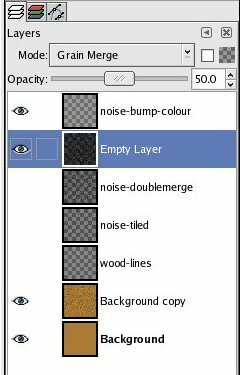 Fill the selection with Black colour in the dirty layer (in image8 its is shown by layer named Empty layer). Change the layer mode to ‘Grain Merge’ and opacity to 50. The basic wooden tile is ready for action. At this point, you can use or modify it for any use you wish. Image-9. In the meantime, the basic tile should be looking like this. Image-11. A planked texture ready for use. This finishes the wood texture creating a tutorial.